One way from 5,500 ISK. Both ways from 7,490 ISK. Destination Blue Lagoon is the official transfer partner for Blue Lagoon, connecting Blue Lagoon to Keflavik International Airport and Reykjavik City. The Blue Lagoon is located right between Keflavik Airport and Reykjavik City, about 20 minutes from the Airport and 40 minutes from Reykjavik. You can combine your Airport transfer to or from Reykjavik City with a stop at the Blue Lagoon, a great way to save time and make the most of your trip in Iceland. You need to book your admission ticket into the Blue Lagoon on www.bluelagoon.is before you book your transfer here. When arriving at Keflavik International Airport, you will find the Destination Blue Lagoon buses parked right outside the airport terminal. You can walk directly to the bus with your pre-booked ticket. The service desk for Destination Blue Lagoon is the Airport Direct service desk, located in the arrivals hall of Keflavik Airport and is open 24/7 every day, all year round. Pick up at your hotel starts 30 minutes before scheduled departure time from Reykjavik. Pick up is with a bright green SmartBus that will take you to Reykjavik Terminal. From Reykjavik Terminal, we drive straight to the Blue Lagoon on a Destination Blue Lagoon bus, your transfer time will be 40 minutes. After your visit to the Blue Lagoon you will take a bus from there to Keflavik Airport, your transfer time will be 20 minutes. All Destination Blue Lagoon departures and arrivals are from Reykjavik are at Reykjavik Terminal located in Skogarhlid 10, 105 Reykjavik. The Destination Blue Lagoon bus is on time, and departs according to schedule . 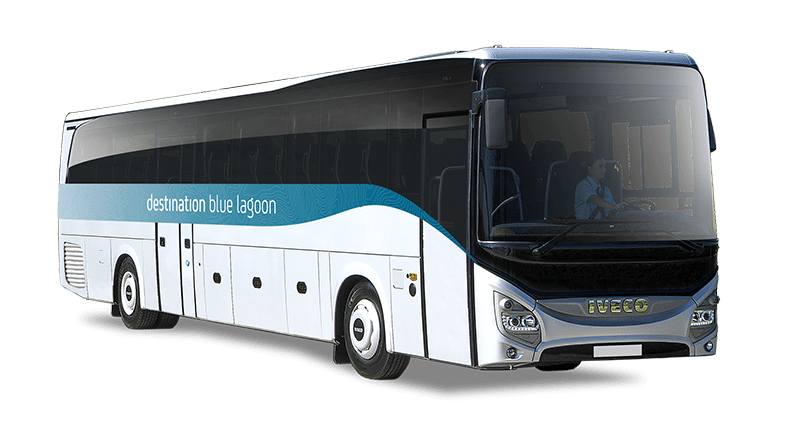 All Destination Blue Lagoon bookings include a free SmartBus hotel drop off or pick up. SmartBus operates a hotel connection from all hotels and guesthouses in the central Reykjavik area and bus stops in restricted bus areas in downtown Reykjavik. For more detailed information, please see the next tab, pick up information. You can add a return Economy Airport transfer from Reykjavik City to Keflavik Airport to your booking. The Hotel Connection for Destination Blue Lagoon is operated by SmartBus. SmartBus is a pick up and drop off service for Airport Direct, Destination Blue Lagoon and Reykjavik Sightseeing, operated on bright green buses. The Destination Blue Lagoon buses drive between Blue Lagoon, Keflavik International Airport and Reykjavik Terminal according to schedule. Hotel Connection is included in the transfer and is operated by SmartBus, a bright green buses, servicing most hotels and bus stops in Reykjavik City.